We went camping this past weekend and the weather was amazing. Probably the best camping weekend we have had in years. Three days and two night with no rain in sight, a beach bums dream come true. I am a big list person. I make lists for everything so I have less of a chance to forget anything. The lists are usually compiled the weekend before so I have the week to locate all our supplies, check for damaged equipment and figure out what I need to buy or replace. I like to create a food list too and have most of the prep done before we head up to Ontario’s beautiful north. The nigh before we leave I am checking a rechecking the list and making sure any food prep is done so all we have to do it cook it and the rest of our time is left for having fun or just relaxing. I usually chop up veggies for various dishes and package them in individual zip bags labeled for the appropriate meal. Breakfast has never been my favourite meal to prepare while camping. I know many like to have the traditional eggs, bacon and toast but I don’t have the patients to do the clean up after. 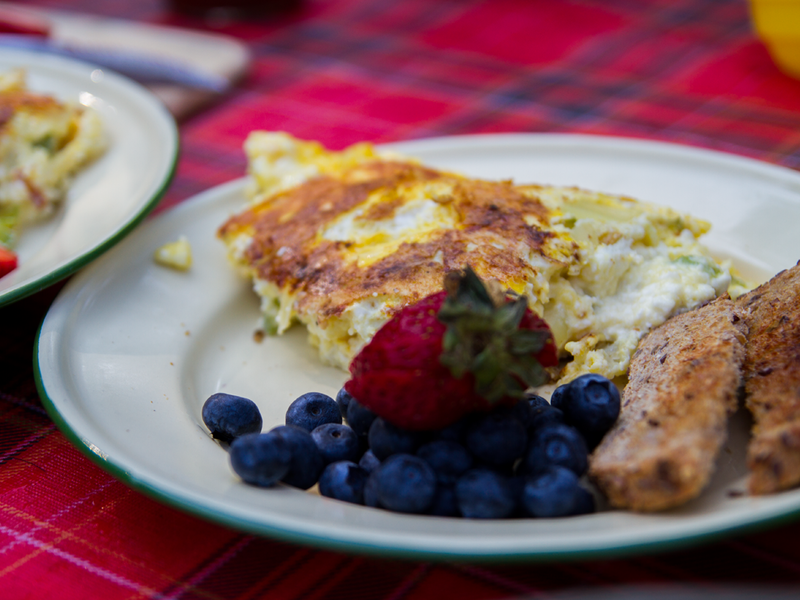 This omelet is super easy to make anytime. 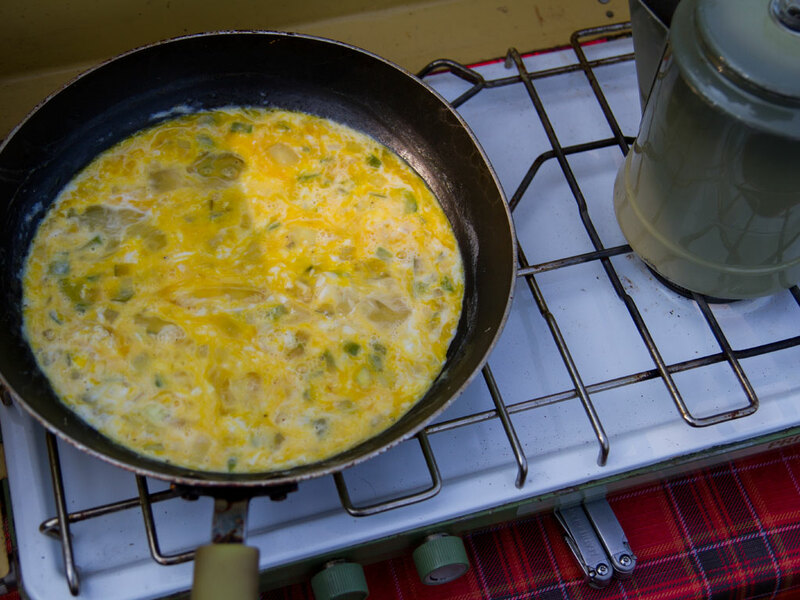 Whether you are camping or want a nice weekend brunch, try doing all the prep the night before and all you have to do is cook it up and enjoy the next morning. The only thing you have to clean in the end is one frying pan which is a BONUS! There are 3.9g net carbs, 15.7g protein and 6 Weight Watchers points per serving. 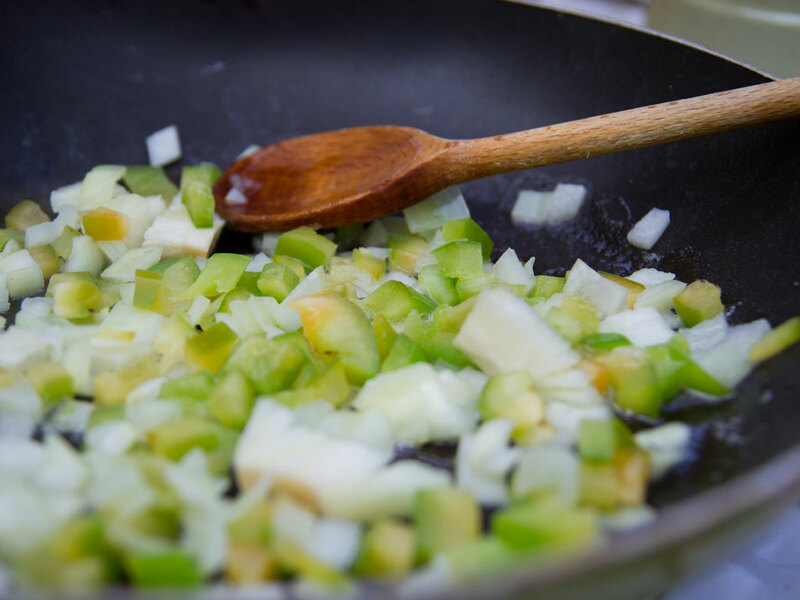 Melt butter in a hot pan and add garlic , chopped onion and green pepper. Saute till translucent. Crack eggs into pan and lightly stir. Add cream and stir again till well incorporated. Once the eggs start to set, gently lift the side of the omelet with a spatula to allow the uncooked egg to run under. Top omelet with crumbled feta cheese and continue to cook till eggs are set and bottom it lovely golden brown. Fold omelet in half, cut into 4 pieces and serve immediately.